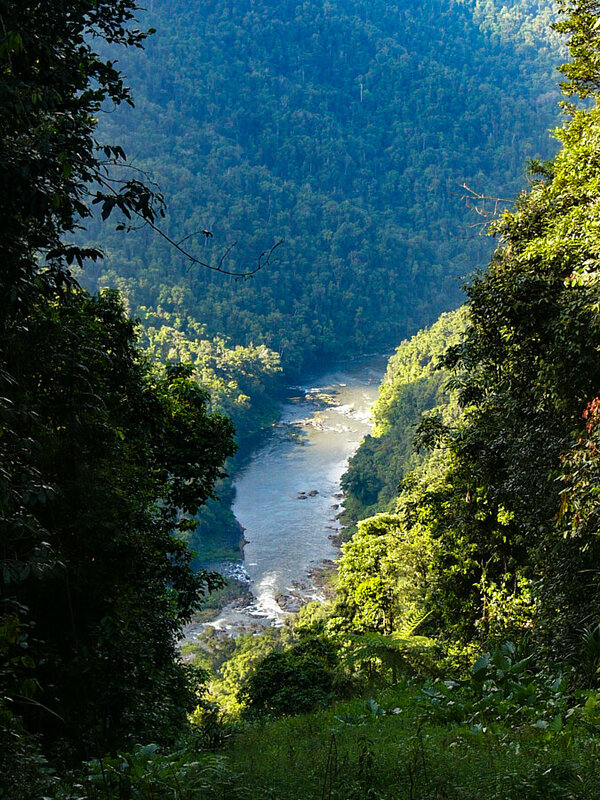 The drive south from Cairns and over the Mulgrave River at Gordonvale passes through a spectacular landscape of rainforested mountains and lush green canefields. The coastal mountains on the left hand side would once have been islands before sea levels dropped in the last 30,0000 years. The range on the right hand side peaks with Mt Bellenden Ker at 1593m (or 5226'). The next range is that of Mt Bartle Frere - Queenslands tallest mountain at 1622m (or 5321'). In between the two ranges is the small town of Babinda which has the highest rainfall in Australia. Babinda's long term annual rainfall average is 4279mm. The record year for readings at the Post Office was 1999 with 6967mm recorded. Measurements at the Mt Bellenden Ker top station are much higher with a record of 12461mm in 2000. I read somewhere that Babinda had a 1 hour record of 305mm or 12 inches. The turn off to the Palmerston Highway is 25km south of Babinda and 1km past the Johnstone River bridge. Mamu Tropical Skywalk is 27km from here and Crawford's Lookout is 1km further on. Doing the Mamu Skywalk and the ground walk will take 1-2 hrs. 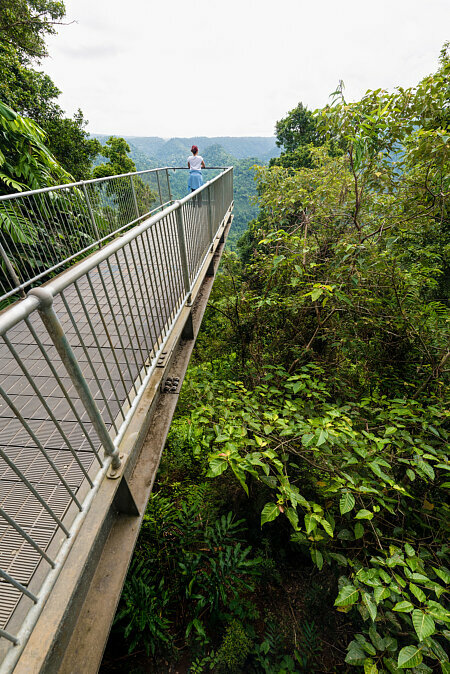 You walk through the forest and along a rising walkway to reach the viewing platform at the end of a 10m cantilevered structure projecting out over the rainforest canopy with a tremendous view of the Johnstone Roiver gorge below. 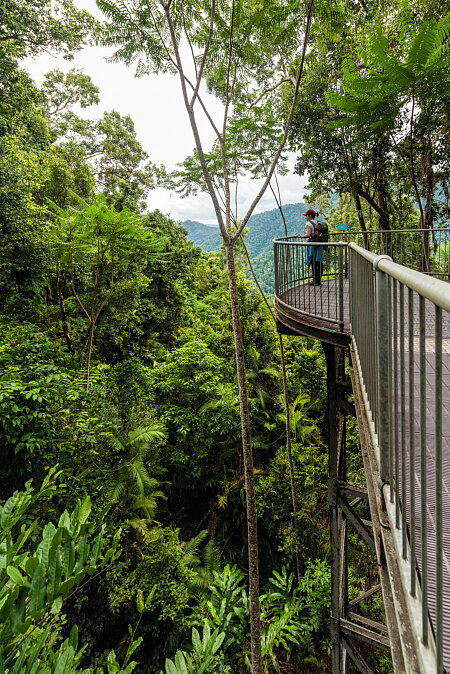 The elevated skywalk is a little further on and meanders for 350m through the rainforest canopy. The Observation Tower is at the end of the forest walk. 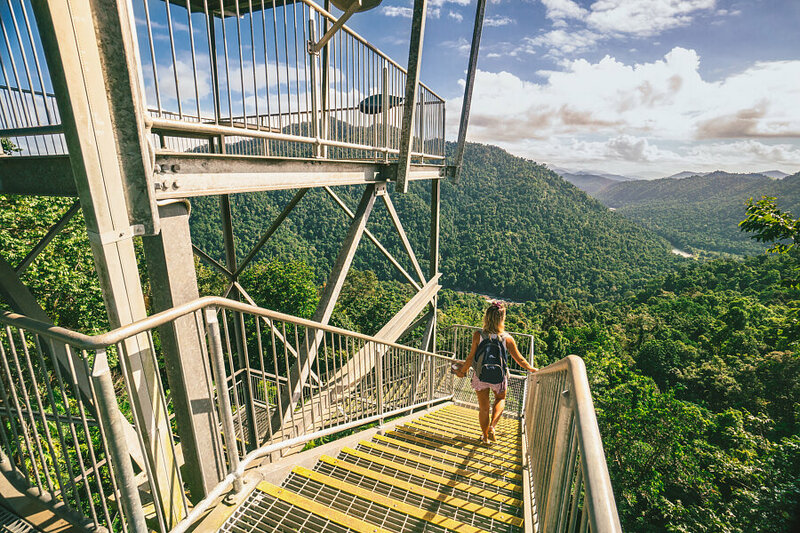 There is a lower observation deck and the high deck 37m above the forest floor. The high deck is reached by steps and is not wheelchair accessible. Crawford's Lookout is 1km past Mamu on the right. A steep winding track drops down 500m in just1.5km to another lookout overlooking the North Johnstone River and Douglas Creek. To reach the river you continue on down the track for 500m. This is a graded a difficult walk and takes 1-2 hours for the round trip of 4km. Continue past Crawford's Lookout for 2km for the Tchupula Falls and Wallicher Falls tracks. They both start off togetther but after 200m the Tchupula track bears right. It's an easy walk of 400m to the falls where Henrietta Creek tumbles over a basalt barricade. This is a permanently damp area supporting many mosses and ferns. Wallicher Falls is another easy walk of 800m from the split with the Tchupula track. You can return the way you came or continue on for 2km to Gooligans picnic area (1-2 hours from Crawford's Lookout). You can continue on another 800m (easy grade) from here to the Henrietta camping area. Unless you are going to walk all the way back you best have someone drive your car on to meet you. The Nandroya Falls circuit walk (moderate grade) starts from Henrietta camp. Cross the footbridge over Henrietta Creek and after a short distance take the left fork for the shorter 1.7km trail to Nandroyaa Falls. It winds along the upper valley of Douglas Creek and passes the 10m high Silver Creek Falls on the way. At Nandroya Falls, Douglas Creek drops in a straight fall for 50m. You can return the same way or by the longer 3.5km route which was the right branch when the track split near the start of the trail. The full circuit will take 2-3 hours.